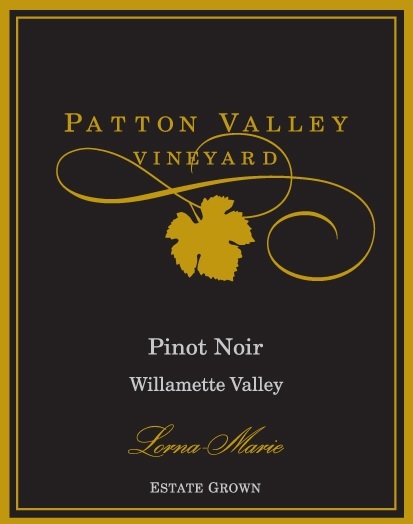 Patton Valley Lorna Marie Pinot Noir is 100 percent Pinot Noir. Each year since 2002 we have crafted a reserve wine intended to exemplify the best the vintage has to offer. Selected from a handful of barrels that are deemed to be the very finest in the cellar, we designate the wine “Lorna-Marie” in honor of the mothers of Monte and Sherie Pitt –two of the owners of Patton Valley Vineyard. Our 2011 Lorna-Marie Pinot Noir appears to laugh at the cool, wet growing season that gave this wine its start. Unlike many of its 2011 counterparts, this barrel selection has the structure and fruit of a much warmer vintage. Leading with boysenberry, cigar-box, smoke, rose petals, and plum, the nose is as rich and concentrated as you would expect from this classic blend. The dark aromatics in the nose are overtaken by mouthwatering, bright flavors of Bing cherry and zesty lemon. The back of the palate is textured by bright acidity and soft tannins that push out the long and lingering finish. Drink now or cellar for 10-12 years. Patton Valley Vineyard was founded in 1995 by Monte Pitt and Dave Chen, two former business school classmates. The estate is located in Washington County, just north of the town of Gaston. Jerry Murray joined the team as Cellar Master and Assistant Winemaker. Located in the northern reach of the Willamette Valley, the vineyard is sited on a hill with views of Patton Valley to the southwest and the Tualatin Valley to the east. This is a 72-acre parcel with the ideal combination of soil, exposure and elevation. The vineyard currently consists of 23 acres planted to a diverse selection of Pinot noir clones. Utilizing sustainable farming practices, coupled with intense hands-on viticulture and low-impact winemaking techniques, they produce wines that are true to the variety and to their particular site, striving for balanced wines with supple texture, richness and ripe fruit flavors. This wine keeps the Lorna-Marie tradition going strong. Reminiscent of the multitude of aromas from a fruit stand, the Lorna-Marie abounds with scents of fresh-picked strawberries, Bing cherries, rose petals, and spiced plum, with a touch of salty sea air and black pepper. On the palate, the wine shows great weight with a viscous, velvet-like texture, and layer upon layer of ripe red and black fruit flavors. This wine possesses a striking backbone of acidity, yet marries beautifully with the soft, creamy tannins, lingering with astounding length. Enjoy now or save for 5-12 years.